The Eleusinian Mysteries were held in the town of Elusia, twelve miles from Greece. The Eleusinian Mysteries were divided into two parts, in the spring the Lesser Eleusinian Mysteries or the Festival of the Returning Daughter, and the Greater Mysteries which took place in the autumn. The Lesser Mysteries were open to all free men and women who were not guilty of murder or other serious crimes. The Lesser Mysteries were a celebration of Persephone’s return from the Underworld and the rebirth of the earth through the miracle of spring. People participating in the Lesser Mysteries were taught the theology of the two Goddesses, Demeter and Persephone, and the meaning of the rites of the Mysteries. Through this process they would become purified and initiated, ready to take part in the Greater Mysteries later in the year. In the rites of the Greater Mysteries they could experience what they have learned culminating with a “vision” of the Goddess Persephone. The Eleusinian Mysteries are still a mystery to us, all participants were required to keep a vow of silence in regards to all they saw and experienced during the rites. The only clues we have are found in surviving art work that depicts some scenes of the Lesser Mysteries purification rituals. The myth of the final task of Herakles, in which he is required to go to the Underworld and face the Goddess Persephone we learn that the only way to survive a meeting with the Queen of the Underworld was through the purification rites of the Lesser Mysteries. The purification rites may have been invented for Herakles. It was thought that anyone who had killed another was stained with miasma, or ritual impurity. Herakles was a warrior and had certainly killed many people and monsters and so the rituals were created to purify him. Some of the strongest clues come from the Lovatelli Urn, The Purification of Herakles, Museo Nazionale Romano, Rome. The Urn has three separate scenes, each revealing clues to the Lesser Mysteries rites. In the first scene Herakles is holding over an altar, a pig and some round cakes as an offering to Persephone. There is a priest pouring water upon the altar and he is holding a tray. The items on the tray are unclear, but could be poppies, pomegranates, cheese, or round cakes. Demeter used poppies to forget her grief over Persephone’s abduction by Hades, and the other items were said to be offered at the Greater Mysteries. The second scene depicts Herakles and a priestess sitting upon a ram’s fleece. Herakles is veiled so that he cannot see, a common feature in initiations. It is thought that initiates in the Lesser Mysteries were also blindfolded for part of the ritual. The blindfolded initiate cannot “see” and is in the depths of the Underworld to be reborn anew when the veil is removed. The Priestess holds a winnowing fan that is used to separate the chaff from the wheat. 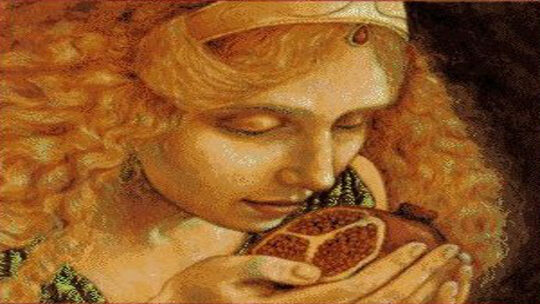 This symbolizes Demeter and Persephone as grain Goddesses and it also has the deeper meaning of purification. As the wheat is purified from the chaff, so is the initiate purified and the soul may be released from the confines of the physical world to rise to its highest purpose. The final scene on the urn shows a purified Heracles approaching the Goddess Demeter. She is sitting on a basket that holds the ritual implements of the Greater Mysteries. On Her lap is a snake, and the newly purified initiate reaches out to touch it without fear. The snake represents the Mysteries and the reaching initiate indicates that spiritual transcendence has been achieved; the initiate is ready to receive the Mysteries. Demeter is not looking at the initiate; She is gazing at Persephone, who is moving towards Her. Demeter remains seated on the basket of ritual items, keeping them hidden from the initiate and She sits between the initiate and the approaching Persephone indicating that process of the Elysian Mysteries is not yet complete.